Fino sherry is a dry, pale Spanish fortified wine. It’s perfect for cooking with as it’s not too sweet and won’t overpower the food, yet it imparts a distinctive flavour. This is a really simple but effective method of cooking a pork roast. It’s a great dinner party dish and has plenty of taste. Absolutely delicious. Take 2 cloves of the garlic, remove the skin and cut into slithers. Stab the pork all over with a sharp knife then insert the garlic slithers into the flesh. Sprinkle over half the thyme and set aside. Add the onions, carrots, remaining thyme, bay beaves and a generous helping of salt & pepper to a large roasting pan. With the remaining garlic, leave the skin on and gently bruise with the side of a knife and add this to the roasting pan. 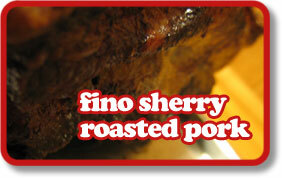 Place the meat on top and then pour over the fino sherry. Make sure the meat gets plenty of coverage of the sherry. Cover the baking tray and leave to marinade for at least an hour, overnight is the best option. Preheat the oven to 180ºC. Uncover the pork remoisten with some of the sherry marinade, then place in the oven and cook for 1 hour, basting once or twice with the sherry. Turn the meat over and then cook for another 2 hours, basting regularly. Let the meat rest for 5 minutes before carving. You can eat the meat with just the juices as they are, but if you want to make a nice sauce, then strain off the juices into a bowl and keep the vegetables warm separately. Melt a knob of butter in a saucepan, add a tablespoon of flour and quickly stir in. Now add the juices, gradually, whisking as you go until all the juices are incorporated. Add a little water if the sauce is too thick. Add the mustard and a little pepper then remove from the heat. Carve the pork into thick slices and serve alongside the vegetables and sauce.